For the record: I hate the iPad . It is the epitome of everything that is WRONG with Apple. With that said, Small World has been converted from boardgame and has been released as an iPad app by Days of Wonder. This is the same boardgame developer known for Ticket to Ride, Battlelore, etc. 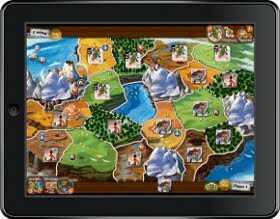 Small World for iPad is the first digital adaptation of this award-winning fantasy board game. It enables two players to face off against each other and vie for conquest and control of a world that is simply too small to accommodate all of the zany fantasy characters that inhabit Small World. Sitting across from each other around the iPad, players use their troops to occupy territory and conquer adjacent lands in order to push the other players' races off the face of the earth. While this isn't the first boardgame to make it to iPad, it's the first one that caught my attention. Small World is a great game and the graphical styling is perfect for a touch tablet. While I don't want to give up my real board games for virtual ones, I realize my shrinking group of board game friends can not keep the fire alive. Virtualization of board games allows me to enjoy them across the Internet in an official capacity (yes, I realize the above app is not Internet based, but other board games are). I am excited about the future of touch tablets filling a niche in the board gaming market.